Home Blog How do emotions affect one's decision making in the stock market? How do emotions affect one's decision making in the stock market? "Be fearful when others are greedy and greedy when others are fearful” is a famous saying by Warren Buffett. Two very important emotions are emphasized which are greed and fear. How many times does one say words he does not mean in anger? Yes “anger” is another emotion which plays havoc with ones decision making. Emotions such as fear, anger and greed form a dangerous concoction causing one to develop the will to win at any cost. This creates a lethal element "Stress". Making the right decision in a matter of seconds is what the stock market is all about. Being bogged down by all these emotions causes one to make all the wrong moves leading to a loss in the stock markets. Remember how you react emotionally is a choice in any situation". Which are the emotions which govern one while starting to invest in the stock markets? When one starts to invest in the stock markets emotions are governed by expectations. Doubling returns in weeks and months is what one expects from the stock markets. Thrill, excitement, and euphoria are the emotions which cloud one’s mind while leaping into the stock market. Which are the emotions which govern one when he starts losing in the stock markets? One has invested his hard earned money, savings and whatever cash he can fork out from relatives and friends perhaps with a promise to repay with interest. One is under immense pressure to make a killing in the stock market. After a few weeks one realizes that the game is not as easy as it looks. Losses mount Fear, anxiety and panic sets in. 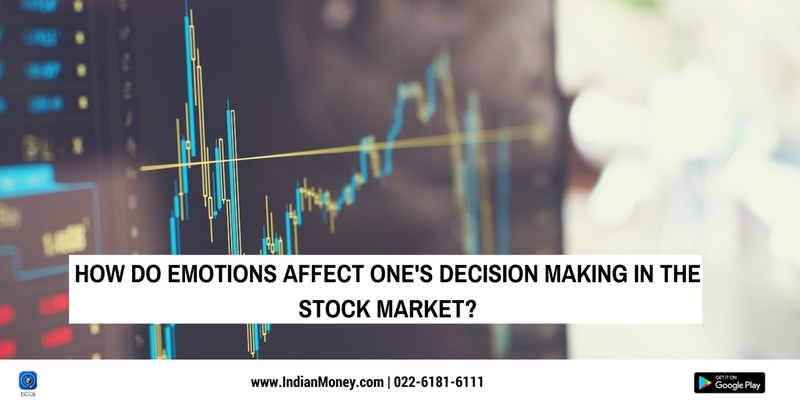 Emotions which govern one when his losses start mounting in the stock markets? Desperation is the main emotion which governs one at this stage. One fears that he would lose everything and tries to salvage the situation. Panic selling is the norm. One has only a notional loss until he cashes out of the market. Then the true loss sets in. One suffers from depression and anger and denial is the emotions which runs riot in one’s body. Anger at the loss and denial that one’s decisions can never be wrong compound the situation. Emotions governed by risk taking. Do they affect decision making? Preconceived notions are one’s biggest enemy while investing in the stock markets .If one watches cricket he sees a batsman decide to play a reverse sweep no matter what the spinner bowls. Many a time this preconceived shot causes the batsman to lose his wicket. Would it not have been better if the cricketer reads the ball and then decides to play a shot? One should not blindly invest in the market with the hope that his investment will yield huge returns .Remember hope is an emotion. An idea of one’s investment goals coupled with sound investment principles is the need of the hour. Arrogance and ego are emotions one should beware of while investing in the stock market. One has heard of the phrase “Putting one’s head in the lion’s mouth”. Arrogance leads to unnecessary risk taking perhaps investing in options and futures which one fully doesn’t understand .Ego and the need to boast of one’s risk taking ability clouds one’s reasoning and result in huge losses. One falls into the debt trap. One needs to stick to investments he is familiar with and not indulge in any false bravado just to prove a point. One needs to temper his expectations and be reasonable while setting his investment goals. Setting ridiculously high a target can only result in a loss. One needs to remember that hot tips and juicy news lead to excitement .The emotion of excitement makes one believe that this investment based on the hot tip is a sure shot winner. Belief is different from hope. Belief is a reason killer. One removes reason from his decision making and the result is a blind entry into the stock market. One needs to be judicious while making his investment decisions. Timing the market means one tries to purchase a stock at rock bottom prices and ride its progress to the top and sell it at an absolutely high profit when it reaches peak price. One might suffer a spectacular loss if timing the market is done wrongly. Clearly SIP in which one always stays invested in the market is a better approach. Riding the wind means that one invests in a particular stock based on its past history. Future earning determines the value of a stock. If one invests in a stock based on its past history with a mind set in stone losses are inevitable. How can one handle emotions while investing in the stock market? Bias : One must have purchased a Smartphone or a laptop from a Company which he regards as a favorite. No matter the situation or the price tag one would purchase the product and this emotion runs down into his stock market investments. One likes the product and purchases the shares of the Company. But is this wise? Share prices may be governed by macro economic factors which are out of the control of the Company .Remember diversify. Never put all eggs in one basket. Going against the herd : There is a famous saying “Buy when there’s blood in the streets”. One normally panics when markets are in the free fall mode and makes a beeline for the exit. This is the time one must buy value stocks obtained at dirt cheap prices. This is akin to plucking low hanging fruit. If one misses the opportunity basing his decisions on fear then believes there is safety in following the herd and succumbs to panic selling then a loss is inevitable. Setting goals : One needs to set investment goals based on the amount of risk he is willing to take to realize his gains. If one is unwilling to invest or trade in futures and options because he perceives a risk level beyond his tolerance then he must not trade in futures. Ethical issues : If one does not invest in shares of certain Companies because they deal in alcohol or cigarettes which go against his ethics then he must not avoid investing in them. One has a stock market which is vast and there are a number of good stocks one can pick up. The need for a cool head : As one knows in any situation and not just the stock markets a cool head is a necessity. One needs to make sound decisions with a cool head while investing in the stock markets especially if situations do not go one’s way. Remember class is permanent. A good stock does not become bad overnight. Panic selling might lead to throwing out the baby with the bath water. The results can be catastrophic. If one is confident that stocks in the portfolio are value stocks then a fall in the markets is the time to accumulate these stocks at lower levels. One should never buy shares when he thinks the market is overvalued. Patience a very important emotion plays a role. One needs to wait until the prices fall and then make the purchase. There is a famous saying “Life is a comedy to those who think. A tragedy for those who feel”. This saying emphasizes the need to keep emotions out of one’s decision making while investing in the stock markets. Remember gain control over emotions. Reap the benefits.